"All The Work Is Done"
Style: Manufactured Home "Larger than Most"
Size: 1,221 sq. ft. "Built On Sunroom"
Year Built: 1986 "Show Great"
Amazing Upgrades just completed from, New flooring in hall, New waterproof laminate kitchen and dining room floors, New roof sun room, New doors, New drawer hardware, Painted throughout, New light fixtures, New ceiling fans, In wall Wired for 7.0 surround sound living room and master Bedroom, New baseboard, window, and door trim throughout, all the Work has really been Done with this Large Bright Mini Home Located in Mountainview Estates, this home would be ideal for empty nesters looking to downsize from the family home, also awesome for first time home owners or anyone just tired of paying rent. 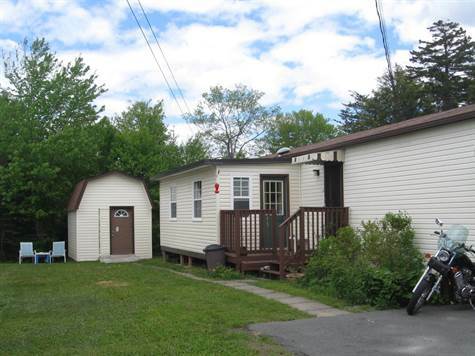 This large 2 BR mini home is located on a nicely landscaped lot which backs on a Green Belt leading to Lewis Lake. The Driveway is paved and there is a wired 10X12 shed with a loft to store the toys in. Throughout the home, there is lots of natural light because of the skylights throughout. All the rooms are a good size especially the bathroom. The living room is also unique as it has pocket doors separating it with a built-in propane insert to cozy up in front of on those cool winter nights. There is even a built on sun-room/porch which can be used for anything from storage to a main level man cave. All appliances are included and the Home is wired for a Generator in case the power goes out. Seeing is believing so call today to arrange your private viewing.